Obama’s explanation for the American lives lost in the Benghazi embassy is “sloppiness…. not intentional”. Listen to more, for yourself, if you are feeling bulimic today. Hillary fell down, hit her empty head, and is unlikely to ever appear before Congress to explain her part in the debacle. No one from the Obama administration has lost their job as a result of this neglect. Requests from security forces leaving Benghazi last August, and repeated requests from the embassy itself, for more security, were rebuffed by the CIA and the White house. Calls for help during the attack were met with direct refusals to assist, and orders to neighboring security forces to stand down. After the attack, no American personnel were sent to investigate for weeks, and CNN reporters freely roamed the premises, picking up classified documents. This odd lack of concern is what fueled the popular idea that Obama has been sending arms to Al Quaeda, and no one involved in that mission was to survive. But Obama tells us that he had no ulterior motives, he’s just incompetent, and he doesn’t mind letting the entire world know it. That should be reassuring to everyone who’s thinking of giving up their guns to government buy back programs, and supporting new and useless gun bans. It took police about 20 minutes to respond to the school shootings at Sandy Hook Elementary, which is NOT a remote area. Teachers and children in public schools are unarmed and unprotected as a matter of public policy. The government has shown us again and again that it lacks the ability and resolve to protect us from violent and crazy people. Is your life worth protecting? Please understand that the government is unwilling or too incompetent to help you with that. It’s a job that you’ll have to do yourself, if you think you’re worth it. Did Paula Broadwell Reveal Classified Benghazi Info During University Speech? | Video | TheBlaze.com. In a speech at the University of Denver, Paula Broadwell gave out some possibly classified information about a CIA center in Benghazi. Specifically she mentioned that there were members of the Libyan militia being held there, and the attack on the Embassy might have been connected with an effort to get them released. This coincides with statements that libyan militia members were turned over to authorities of that country on September 12th, after the attacks. 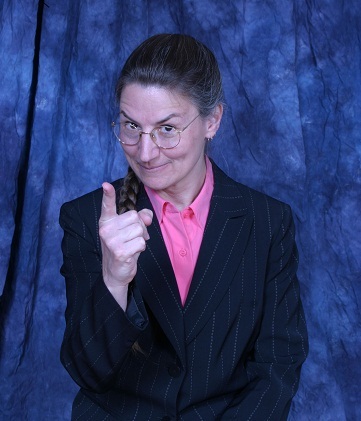 Broadwell told her audience that Petraeus knew almost immediately that the Embassy was attacked by terrorists. Petraeus testified in a closed congressional meeting that the Benghazi attack was spontaneous, and motivated by the anti Islam video. More can be found at Fox News. via Kessler: FBI Investigation Led to Petraeus Resignation–NEWSMAX. The FBI investigation on this problem started last spring, with the agents expecting that Petraeus would be fired quickly, due to the compromising potential of the affair and the above mentioned strange behavior. This weirdness of wasting so much time with the thousands of emails after the relationship (with biographer Paula Broadwell) was over, apparently doesn’t flag as unusual enough for a resignation request by the Obama administration. The Petraeus security threat remained for almost a half year after it was apparent. Thousand’s of emails! If this is true, then the guy is completely crazy……. Who will believe whatever he has to say about Benghazi? What a mess. Understandably the Navy SEALs are quite Unhappy with their Commander in Chief after finding out that their compatriots in Benghazi, Libya were denied assistance directly from the White House. The Special Operations Speaks PAC put up a Facebook page with the following image to express their displeasure. It was removed with a warning from Facebook. 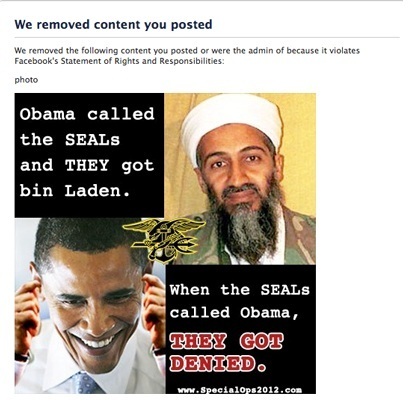 The SOS PAC replaced the image along with a link to Facebook feedback, for people to express their outrage at the censorship, and were promptly suspended from Facebook. Apparently the folks at Facebook hold their loyalty to Obama uppermost over their function as social media, and overall customer satisfaction. Stockholders should expect for Facebook to gradually fade away…. Pharmer is carrying the SOS PAC image so you can see it. “Sandy” They’re Awfulizing the Big Storm Again! Remember the hand wringing prior to “Hurricane” Irene hitting the northeastern seaboard? Well, they do this every time. Soon no one will listen to the lamestream weather criers anymore, and perhaps everyone will fail to respond when a real disaster hits. This time, Matt Drudge, who is a disaster junkie, has been saving his red headlines for the stories about federally induced storm panic. Sandy is one large storm, but as it’s hitting land it doesn’t rate as a hurricane if you pay attention to the wind data coming from the weather stations which feed Wunderground.com. Pharmer picked two… One in Robbins’ Reef NJ, because there was news about evacuations in New York City, and one in little Assateague Island, out there all by itself, east of Maryland. Pharmer expects the storm to blast that island hardest. The wind data is in Kilometers per hour on the weather station flags. 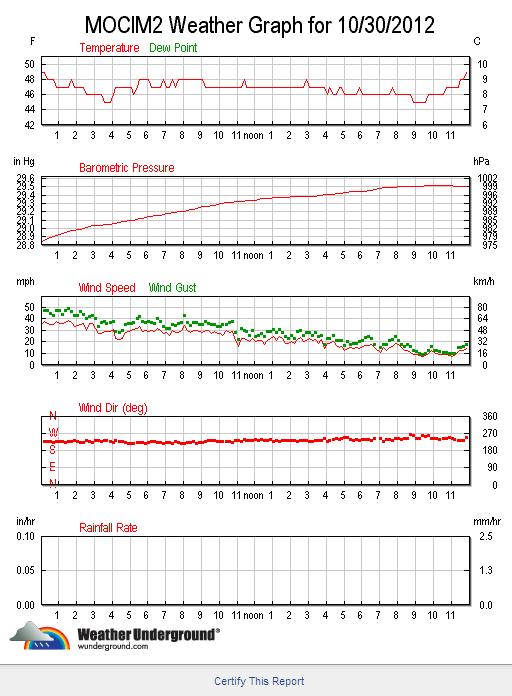 Look at the graphs and you won’t see wind gusts above 50 mph, and sustained winds are much milder. You know what that means. It’s just like a summer storm, down on the Pharm, only lasting longer than usual. It’s a mess, but not worth the big warnings to evacuate. Why does the media cause more economic destruction than the storm would by itself?? 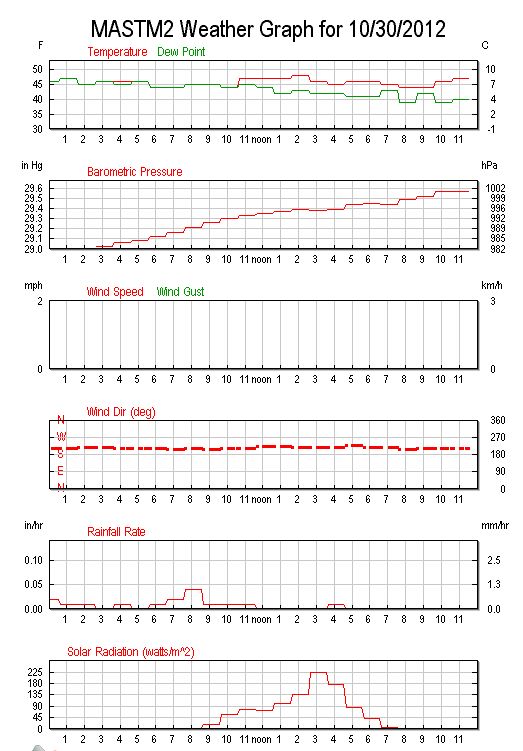 Check the Robbins Reef Wind speed graph below. Sorry weather criers, Sandy is not going to give Obama such a big chance to look presidential. In fact, we might even be able to get back to learning more about why Obama refused help to the Libyan Embassy in Benghazi when it was attacked. Update: Pharmer sees the weather stations still tracking after midnight, with the wind not getting worse, and…….. you know the power hasn’t been knocked out yet. 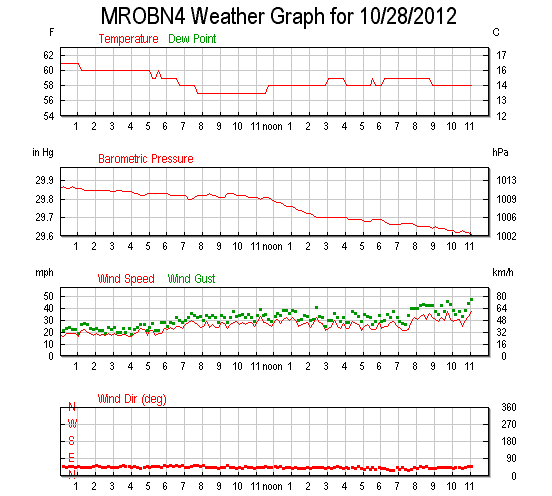 Update: 6am 10/29 Winds at Robbins Reef, NJ are around 30-35mph, and gusts have not yet hit 50mph. The worst of the storm has blown through Assateague, MD, but another milder area is overhead. Winds there are calm and they’re getting a LOT of rain. Update: 1:18 pm The storm has shifted direction and is heading north ward. 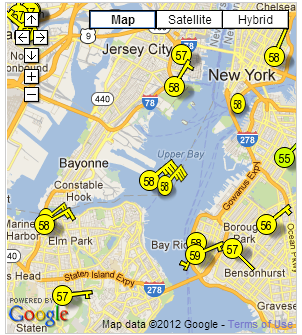 Winds are picking up at Robbins Reef, with sustained winds in the 40s and with gusts in the 50s MPH. Unfortunately for Assateague, the storm turned before blowing further westward. 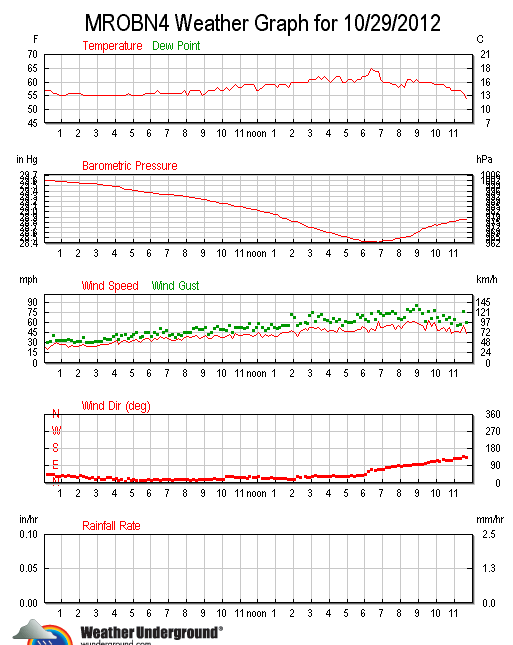 It looks like the weather station is giving winds ranging from zero to gusts in the 80’s. As it is registering mostly calm winds, Pharmer thinks it’s down. 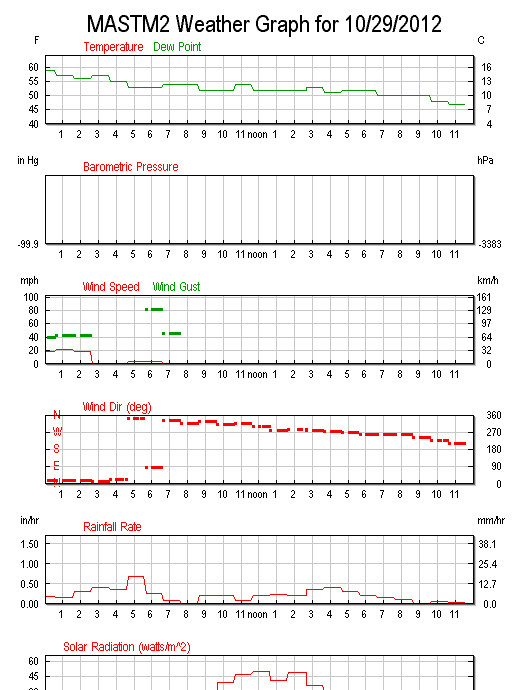 Wunderground has stopped displaying weather station data, due to bandwidth shortage as of just before 2 pm. The winds at Ocean city, MD have appeared to die down to the teens. So far it looks like – Pharmer is right, the media has kept Sandy awfulized to a hurricane, though it hit as a tropical storm. But Pharmer is wrong about needing to evacuate. Flooding is turning out to be cause for evacuations in coastal areas not prepared for such Wetness. The politics? REALLY! Obama flew to Florida to campaign yesterday, but was flown back to monitor the storm. What’s on the news? The Obama campaign is wondering whether the storm can be utilized to help his reelection effort. Tacky Tacky Tacky. Pharmer sez, use Wunderground and your own gossip chains, NOT the media, to decide where to send aid to wet and cold people. Robbins Reef NJ on day 2 This place is getting the most wind. 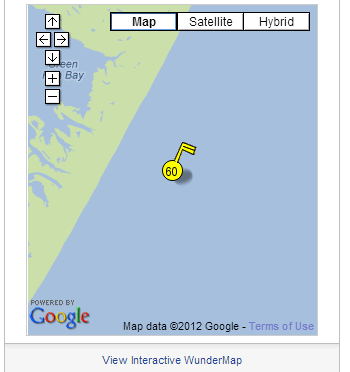 Assateague Island on 10-29, showing when it’s wind monitor broke. 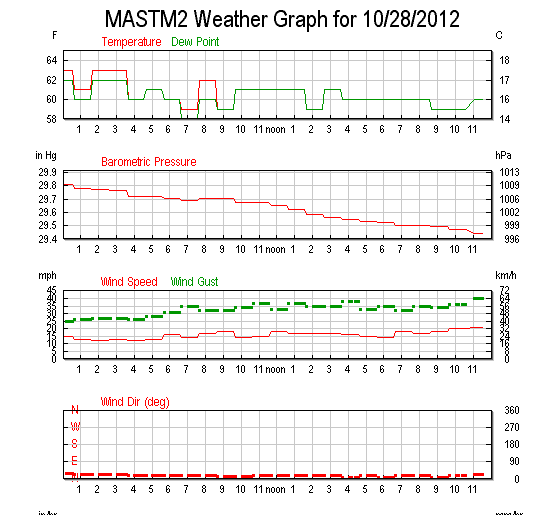 Ocean City inlet, MD which is near Assateague, was picked up to display the wind on 10-29. 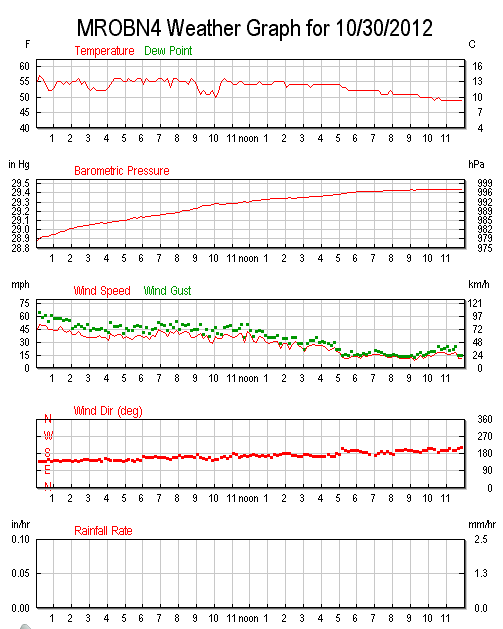 Be sure to check the amazing change in wind direction which is shown at midday. 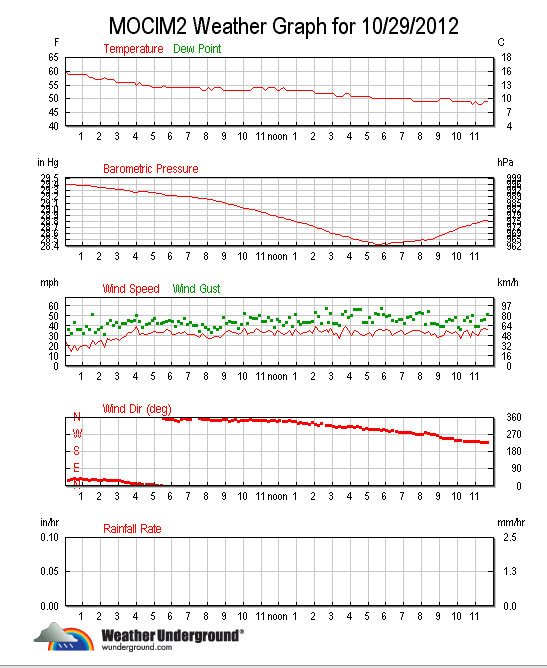 This is close to the time that Assateague’s wind monitor wiped out. Sandy is pretty much finished with these three locations, and now they can start mopping up the mess. Why did the weather stations send continuous data to the internet? 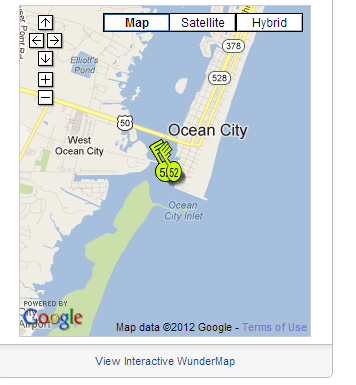 No power outage at those locations, near where Sandy made landfall. Unlike the days of Nixon, the media has assisted Obama in his cover-up of the actual occurrences and portrayed a false view of both the occurrences in Benghazi during the U.S. 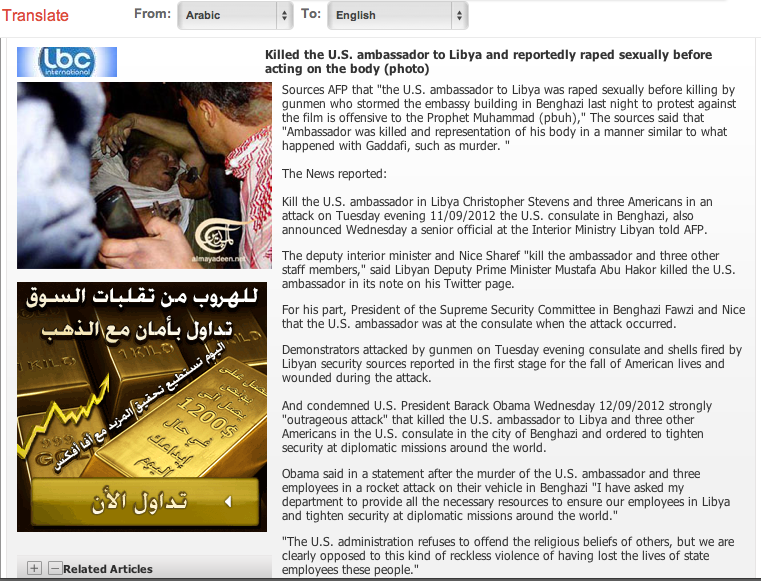 Ambassador to Libya was killed along with three other Americans. CBS has decided to do a 180 and bust both itself and Obama for the negligence and the coverup, which resulted in unraveling of the U.S. stature in the Middle East, as well as the unnecessary loss of life which extends far beyond the four people killed at the Embassy. Libya-Gate is far too gentle a name for the egregious failure and negligence and dishonesty which characterizes the handling of the Benghazi incident. The cover-up of the Watergate burglary is Nothing compared to this. CBS has let loose an unaired 60 minutes clip which establishes that Obama lied about the nature of the attack on the Libyan Embassy. If you will recall,we were told repeatedly by the Obama administration and its media allies that the attacks sprang out of natural protests of a video that almost Nobody knew about before the U.S. government advertised it. What is essentially has been coming out of this incident is that the Obama Administration has been assisting the wrong Midde East factions,Al-Quaeda is alive and well, Obama failed to answer the “3am call” -choosing to campaign and raise funds instead, Obama and the media covered it up, and an American has been illegally persecuted for producing a video that had nothing to do with this. CBS chose not to air this clip from Sixty Minutes for an entire month. Clinton: I’m responsible for diplomats’ security – CNN.com. Hillary is taking the blame for the death of U.S. ambassador to Libya in Benghazi, saying that the diplomats’ security is the job of the state department. This is in tune with Biden and Obama’s attempt to absolve themselves from blame for removing U.S. security from the Libyan embassy, and for refusals to heed requests from ambassador Chris Stevens, who was killed there. Prior reports that Stevens was raped before he was killed came from Tayyar.org (Lebanon news) which credited the AFP. The AFP complained to Tayyar and the news page in Arabic, as well as video claims have been scrubbed from the internet. No one wants credit for initial reports that Stevens was raped before, during or after he was murdered. The Washington Times is keeping this view of the Google Translated Tayyar.org article. If this link disappears, notify the Pharmer in comments, because it can be restored.